Screamer Radio is a simple to use Internet radio player and recorder. 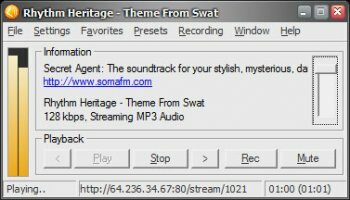 Supported stream formats include Shoutcast/Icecast (mp3 and ogg) and Windows Media Audio. Singapore radio stations are IDLING..
Philippines radio station are IDLING.. a.) when you first start the player, make sure to go top menu>recording>begin recording and make sure it is checked OFF. For some reason it was already enabled when I downloaded the portable version. YMMV of course. b.) As was mentioned before, the gui could use updating, maybe add vista/win7 taskbar controls (as windows media player classic already does) or basic skinning support. c.) Regarding radio presets, there are times when stations fail to load "gives up" (as the radio station may have changed iURL or network ports), so you need to manually edit or add stations occasionally. For example under the "salsa" genre, there are 10 listed, but only one "sky FM" actually works. YMMV of course. I have toyed with this program for years. It does what it is advertised to do, plays internet radio streams, and does it quite well. I find that there's a very small memory footprint, and doesn't take up your desktop. The interface is a bit weak. All the functionality is there, however, I wouldn't mind seeing some degree of skinning and maybe a mini-view when it's playing in the background. It reminds me of a media player from 1998. One thing I will say is that it gives one of the most thorough listing of radio stations of the other media player programs. I believe the lists are compiled from the shoutcast yp, icecast yp, and then personal submissions from users on their forum. All my favorites are there, and tons more to choose from. That all being said, it's great. Works excellent. Just could use a face lift. Unfortunately this comes with lots of presets from all over that simply don't work and even if you know the proper url, it is impossible to correct it's internal list. If you want a simple gui to record a simple stream, look no further. The fact it's presets are such a mess is what turns me off completely. It's like looking to buy a car with a convertible top, and getting it home and finding out you bought a lunchtruck. I use it almost daily and it works well for me. Just use xmplay for radio streaming. I haven't found anything close, certainly not SR. The menu tweak must have gotten rid of the interface bug I was speaking of. Running XP, I still pointed the install to the programs folder overwriting v0.4.2 with no problems. Tip.In changing favorites you can simply your ad your own station if not present in the list in a notepad presentation simply by copy paste the allready present favorite(s) with your own url replaced, tested&works!In version 0.39 there where some problems rembering the added favorites, it seems that has been solved now with version 0.43. Low CPU usage offcourse, you do not mention that is ON except for the music offcourse! Edit : this can be changed in Preferences! Absolut 5* worth! I find it hilarious that henrypeck tries insulting me (a common response after one gives free crap a low rating), and then claims that the version I reviewed was a "beta". In fact, 0.4.1 was not, and neither is this version. Look at the home page, it says: "Latest stable v0.4.3 | Latest beta No current beta". I'll never apologize for rating as I see fit. Grading on a curve is senseless. Sorry this is a piece of crap. I know Screamer has its fans. But, no offense to the developer, who I'm sure is working as hard as he can, but this program is not being patched at all quickly, and certainly later versions are not ready for prime time. These are alpha releases at best. Consider, for instance, the windows stack problems that will bring your machine to its knees if you play this thing over a couple of days. How long has this problem been reported? Also, the presets make the whole thing lose menus, and this has been happening for how many revisions. Come on. I know its freeware, but does anyone need this hassle to run a radio program? Look. Save yourself a lot of grief. Download the best little player in the world. It's called XMplay. It has an amazing radio stream feature. It works like a rock, it actually screams, and is frugal on resources. But it will also play more than radio stations. It's simply the best solution I've seen. Winamp isn't bad either. I just find all these browser features and what not distracting if I'm just trying to work with the radio streaming some instrumental. Also, Winamp is less than frugal. Honestly? xmplay streams and sounds much better. Author doesn't update presets even when asked to in forums and apparently neither can I. I only like one station (3 really) and xmplay handles them fine.